Fixed star Toliman, Alpha Centauri, is the brightest star in Centaurus constellation, the third brightest star in the night sky and the closest star to our solar system. It is situated on the left front hoof of the Centaur Chiron. The name Toliman comes from the Arabic al-Ẓulmān, meaning “the ostriches”. It is sometimes called Rigel Kent or Bungula. Rigel Kent is the romanization of the Arabic Rijl Qanṭūris, meaning “the foot of the Centaur”. Along with Agena, it makes up the Pointer Stars to the Southern Cross, constellation Crux. 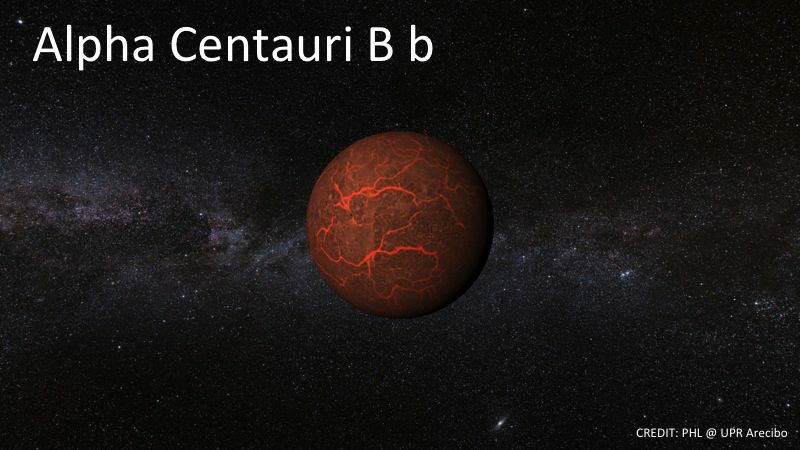 In October 2013, it was revealed that the Toliman star may have an orbiting planet termed Alpha Centauri Bb. If verified, it would be the closest exoplanet to Earth ever discovered. It has a similar mass to Earth but its orbital period is only about 3 days. 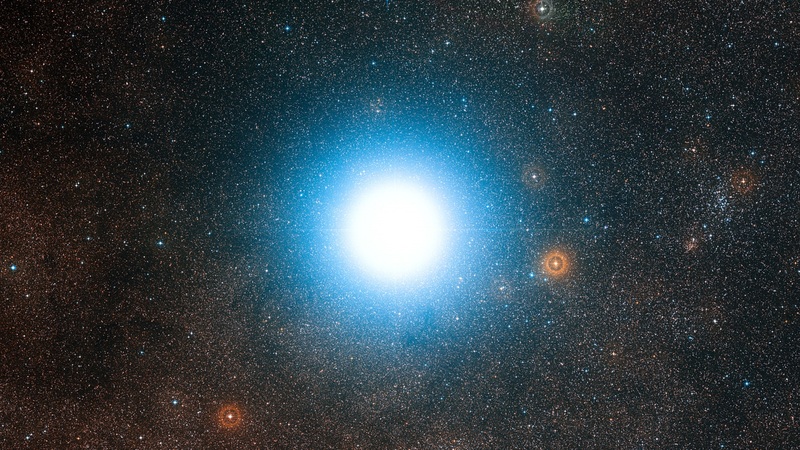 Alpha Centauri Bb which is shown in the image below. α Centauri is actually three stars very close to each other as we see them, and one of them actually the closest star to use in real distance, a mere 4¼ light years, so that it is called proxima Centauri. More generally, however, α as a whole is called Rigel Kentaur, Foot of the Centaur. Another name for it is Bungula, again meaning Foot if we remove the inexplicable ‘B’ from it. Yet a third name is Toliman, mentioned here only because readers may ind it in the odd book or so. Given Venus-Jupiter acclaim by Ptolemy, this much admired star trio is 29°33′ Scorpio. 1. Fixed Stars and Constellations in Astrology, Vivian E. Robson, 1923, p.37, 148,149. 2. Fixed Stars and Their Interpretation, Elsbeth Ebertin, 1928, p.64, 65. 3. The Living Stars, Dr. Eric Morse, 1988, p.166, 167. 4. Fixed Stars & Judicial Astrology, George C. Noonan, 1990, p.73, 74. 5. The Fixed Star Health and Behavior Imbalance, Ted George and Barbara Parker, 1985, p.97, 98. What does it mean when North Node conjunct Toliman, and South Node conjunct Alcyone? LOL I’ve just realised why it doesn’t work – because my moon isn’t conjunct Toliman- wrong end of Sagittarius. What about if toliman conj the ac..? Ok,Jamie. It was clear. Thanks. A person who has this conjunct Ceres in their chart has given me grief my whole life. No other major aspects to Ceres to warrant it (just saying – I don’t think the Venus and Jupiter nature came through…. ).